WOMAN OF THE YEAR is a romantic comedy from director George Stevens (SHANE, GIANT), starring a very young Katherine Hepburn and less young Spencer Tracey. They both play journalists on the same paper, but that's about all they have in common. Tracey's Sam is a salt of the earth sports journalist with few pretensions. Hepburn's Tess is the daughter of a diplomat, raised in many countries, fluent in many languages, addicted to work, wielding political influence, and feted by all. The meet-cute is a public argument about the role of merits of baseball that results in a mutual attraction and a tentative attempt at dating. She goes to a ball game in a hat and gloves, he gets bored and abandoned at a party with diplomats. And yet despite all this, they get married. The movie then enters darker territory and the mood turns from witty banter to discomfort. Hepburn still looks stylish in her "gowns by Adrian" but transfers into a ladies "smoking" and flat shoes. She's clearly the boss in the relationship, wriggling out of difficult conversations by acting pettish. She goes from dominating her husband to actually putting him down and the audience as well as Tracey loses patience with it all. This is especially true of a particularly distasteful plan to adopt an immigrant child. This is a risky move from writers Ring Lardner Jr and Michael Kanin. Just how unlikeable should one make the heroine? Of course they save the ending by giving her a humiliating scene of physical comedy-incompetence and a last minute compromise between hero and heroine. But just how convincing is it, and how far is this just another one of her ruses by which she wriggles off the hook? The result is a film that remains modern and relevant in its depiction of a normal man struggling to deal with a deeply ambitious wife, but also a film that has a somewhat more ambiguous ending than perhaps the writers intended. 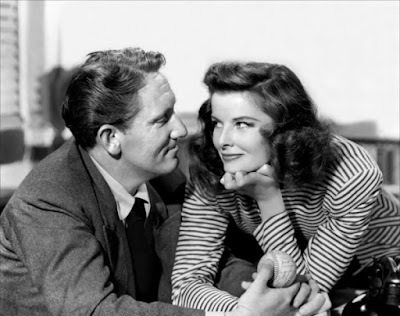 Nonetheless, or perhaps because of that, they rightly won the Oscar for Best Original Screenplay that year, and Hepburn was nominated for an Oscar but lost to Greer Garson for Mrs Miniver. WOMAN OF THE YEAR has a running time of 114 minutes.